thread (HW strand 0) and the 2 e1000g interrupt threads. The remaining cores were used for network and disk interrupt handling. 2x 146GB SAS disks for OS and application software using UFS. Four application server instances were hosted in 4 separate Solaris Containers. consisted of 4 cores (32 HW threads) using resource pools. The fourth container used the default processor set. The Solaris Container and Resouce Pool configuration is in the FDA. Interrupts were enabled on one HW strand per core. where all 4 containers shared a 1GBit NIC for this subnet. This extrapolates to 121 GB storage for a 24 hour run. 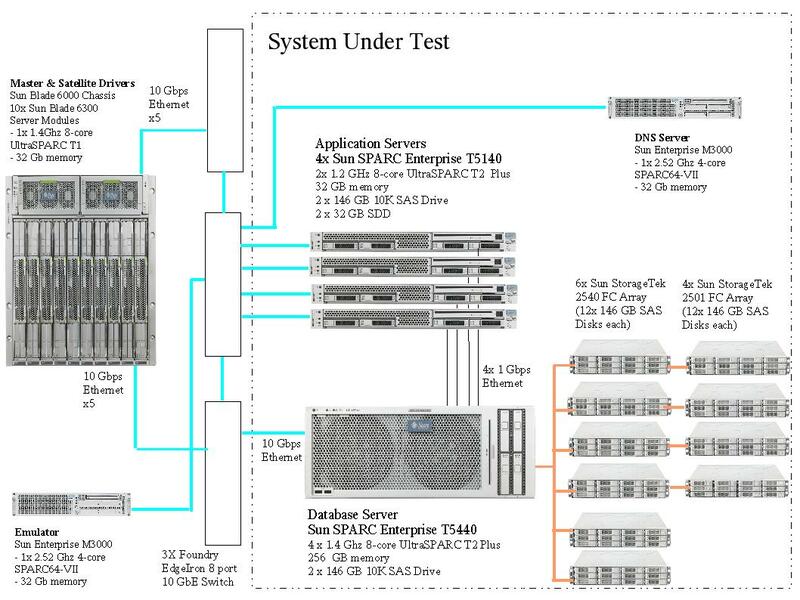 SPARC Enterprise T5440 and Sun SPARC Enterprise M3000.